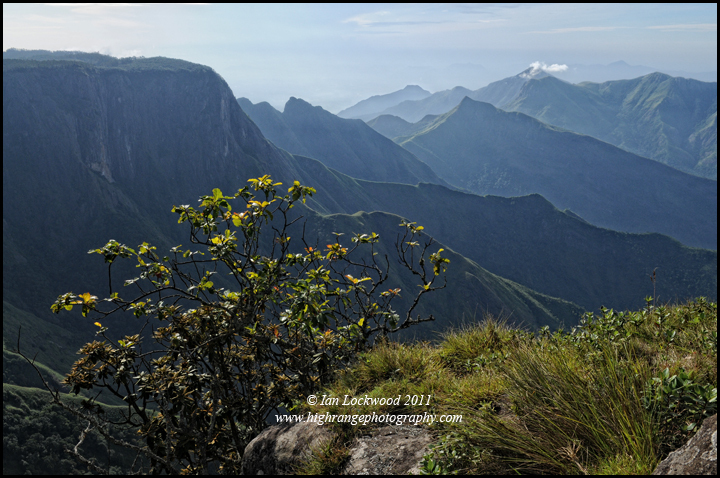 Panoramic view east from Pass Peak, a promontory and favorite Nilgiri tahr perch, near the Marion Shola forest bungalow. The peak looks out over a chasm and then the vertical cliffs of the escarpment to the Agamalai range of hills. On the first trip we had spent four days on the cliff area between Ibex Peak (the 2nd highest peak in the Palanis at 2,516 meters) and Vandaravu (the highest peak in the Palanis at 2,535 meters). In the second trip we made our way to Marion Shola via Berijam and then surveyed its cliff and marsh areas for three days. 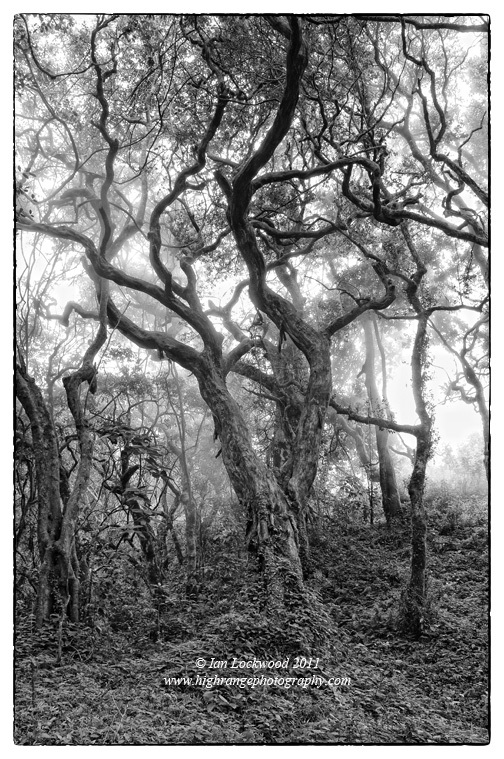 Marion Shola is an old favorite haunt and camping spot for people familiar with the Palanis. In days past its bungalow was an important stopping off point on the 80 Mile Round and has been the destination of many happy camping trips for generations of hikers. It once commanded a panoramic view southwards over rolling grasslands to the dramatic cliffs of the escarpment. Plantations of various non-indigenous trees now block this view. My parents brought us here on one of our first camping trips in 1980. The inimitable rascal and con artist Perumal was supposed to help us organize packhorses from Berijam, but he failed to show having taken a chunk of money as a down payment. That story joins the legions of famous Perumal tales and it provided an interesting anecdote as I brought my own family on our very first camping trip together. The road from Berijam Lake to Marion Shola is badly pot-holed and virtually abandoned. Trees have fallen over parts of it and several times we had to saw and hack our way through thickets. Elephants seem to like using it and I was astonished to see more than 20-30 piles of their droppings on the way (in days past elephants were extremely rare in the upper Palanis). 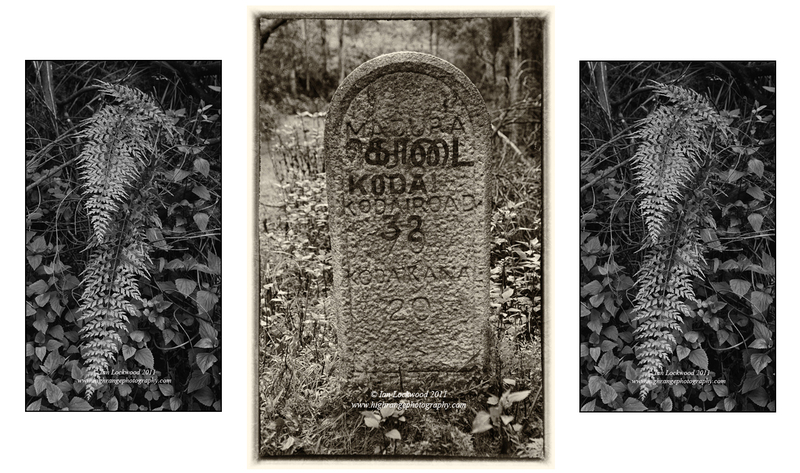 Granite milestones still mark what was once the road between Kodai and Munnar (built as an evacuation route in the 1940s in anticipation of a Japanese invasion). We based ourselves at the Marion Shola bungalow, which though dilapidated is still standing and provides shelter during heavy showers. Milestone from the 1940s on the now derelict Kodai-Munnar road. Once again Bob & Tanya from the Vattakanal Conservation Trust played a key role in organizing this trip, securing permissions and ensuring that any findings would find their way to the Forest Department. Their range officers and other officials in the area are indeed very interested in the potential for restoration in the area. Two officers visited us during the trip to talk about specific grasslands restoration ideas. 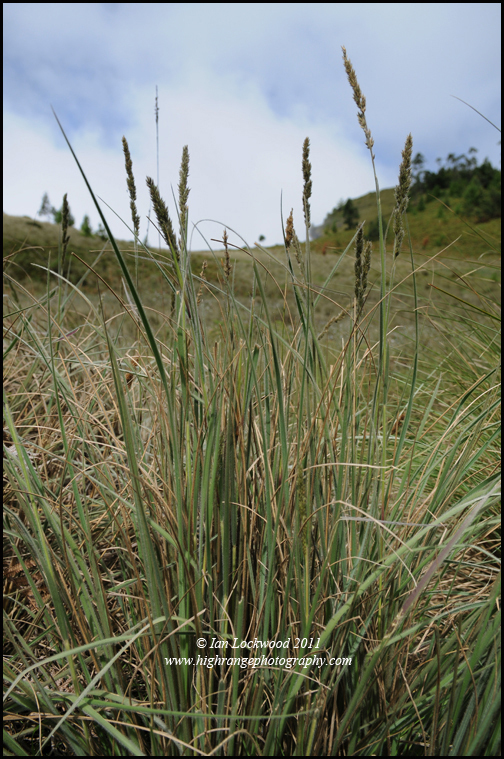 The issue of grasslands invasion by non-native species was once again brought to our attention. Near to the bungalow the grasslands parallel to the cliff are being overtaken by eucalyptus and wattle. At Prayer Point a place (see images) where we have traditionally come to see the cliffs, wattle trees have grown out over the edge of the cliff. We had a sighting of the herd of Nilgiri tahr that is regularly seen here. 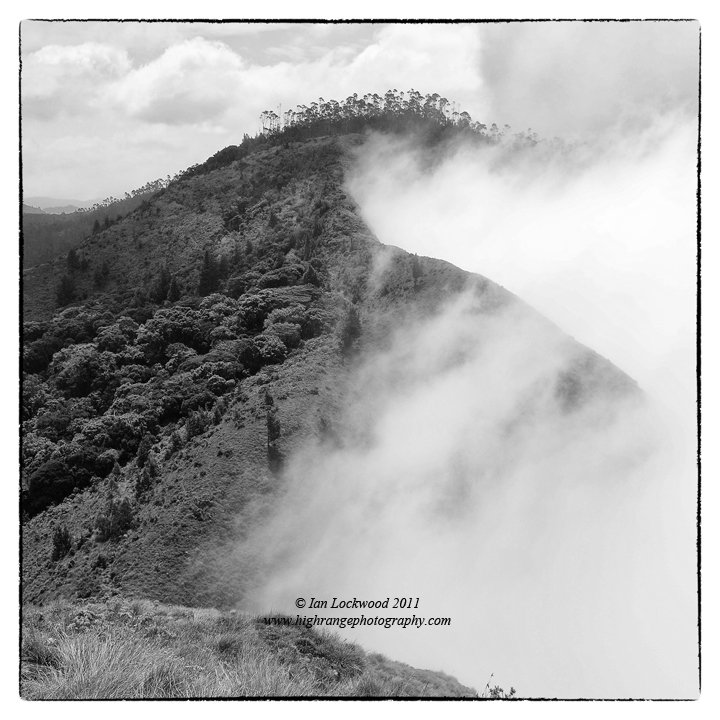 We had last seen and photographed them on our Kurinji trip in 2006. This year’s Tahr census reported some of the healthiest populations from here and the nearby Pass Peak. On the 2nd day we explored westwards to a promontory labeled on survey maps as “rocky knob.” The 80 Mile round hike takes a short cut that cuts off this fascinating section of cliff and, thus, most people are unfamiliar with it. In May 1990 I had camped here with my schoolmate Matthew and we had explored the cliff area and pockets of shola. At one edge of cliff dense shola tumbles over the edge down to the lower plains near Bodi. The “secret shola” is still very healthy and on this trip we found what looks like a path at the top. The survey map has a marked trail descending to the plains through the valley. We will leave this task to the able talents and explorations of Bruce Dejong who was searching for the path on our earlier expedition to Ibex Peak. Unfortunately the grassy cliff path has been almost consumed by wattle and pinus trees. We returned to Kodai convinced that this area is in urgent need of restoring action. Jay, from the Vattakanal Conservation Trust, looking for Nilgiri tahr (Nilgiritragus hylocrius) at Prayer Point near Marion Shola. A herd of 6-14 animals was immediately below us. 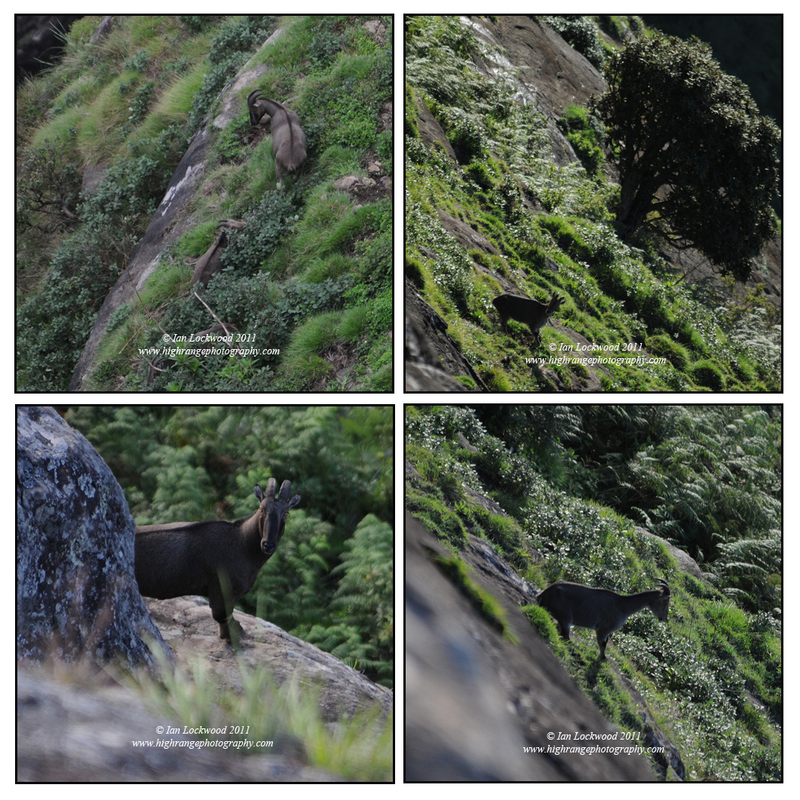 Collage showing individuals from the herd of Nilgiri tahr (Nilgiritragus hylocrius) at Prayer Point. A saddleback (adult male) is prominent in all of the images. 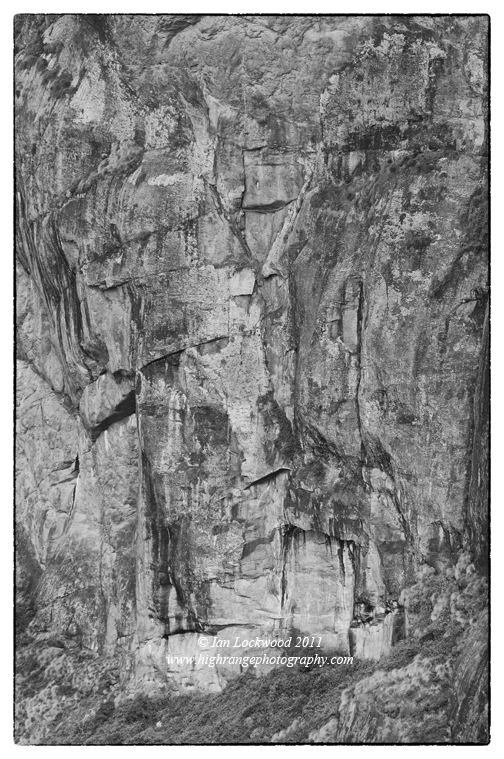 Note the abundant grasslands and near-vertical cliffs. In July 2006 I photographed tahr amongst Kurinji plants in the same location. This image of the hillside near Prayer Point illustrates the alarming invasion of native grasslands by seedlings of eucalyptus trees. 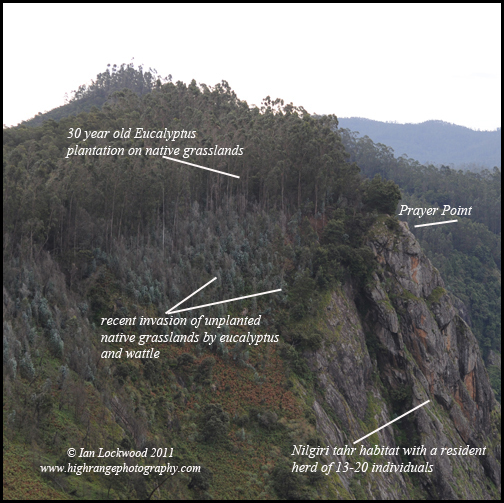 Compared to the acacia (wattle) species on the upper Palani Hills plateau, eucalyptus is generally not considered a danger to grasslands. What we saw on the survey was a reminder of the urgent need for ecological restoration of critical grasslands habitats such as these. Agamalai range from Pass Peak, a prominent point west of Prayer Point. This is ideal Nilgiri tahr habitat and virtually inaccessible to most survey teams, trekkers, and poachers. Secret Shola revisited. 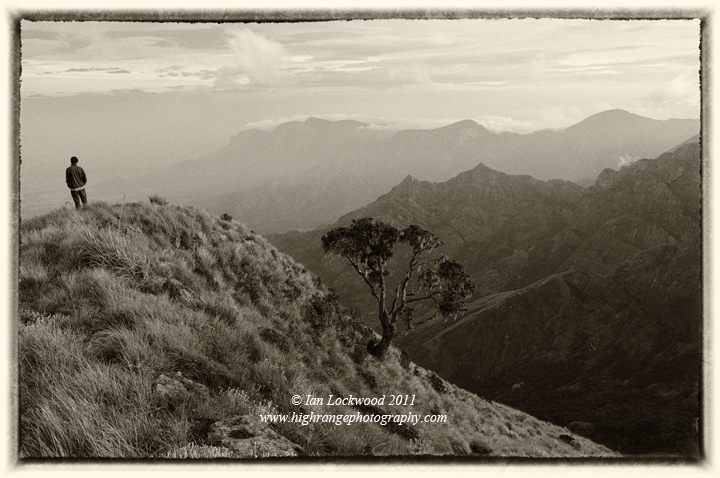 A beautiful shola sits on the edge of the escarpment. The amphitheater cover with nettles may have been caused by sustained grazing by herbivores. There is also evidence of an ancient path connecting the upper Palanis to the plains town of Bodinakanur. 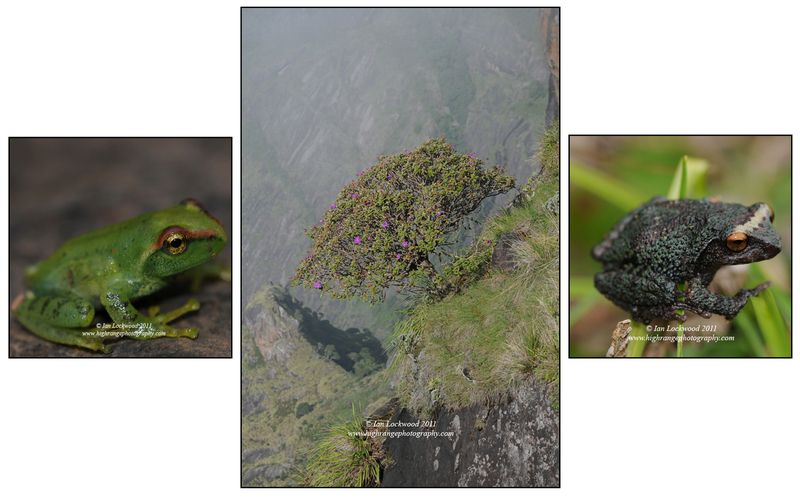 Endemic frogs (Ghatixalus asterops and Raorchestes dubois) from the upper Palani’s plateau near Marion Shola. The center picture is of Osbekia sp. in flower on a precarious perch below Ibex Peak. Grasslands just blow Ibex Peak. This small area had one of the richest marsh areas that Bob & Tanya have observed in the Palanis. View from Prayer Point looking east and down southwards over the Agamalai Range and plains area near Theni and Bodi. Pass Peak is on the far right. A large Vaccinieum leschenaultii tree being engulfed by afternoon mist in the Secret Shola. Looking east as mist flows up over the bluffs between Ibex Peak and Ibex Cliff. The shola/grasslands mosaic is quite intact though there are invasions of Pinus sp. on the grasslands. 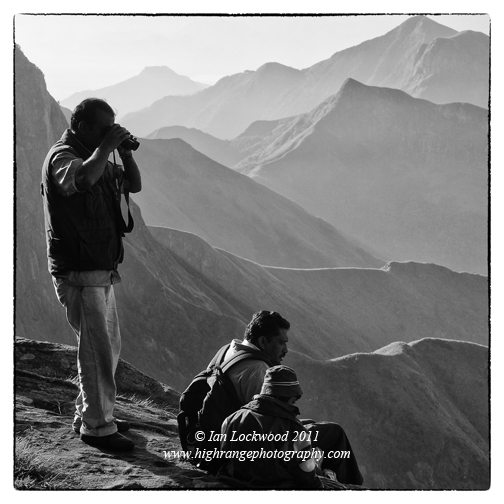 To anyone who knows the southern Western Ghats it is incredulous that they are frequently referred to as “hills” rather than mountain ranges. All of the large ranges in the Nilgiri, Palani, Anaimalai, Highwavy and Ashumba ranges have cliff faces, peaks and escarpments that make them anything but “hills.” I was reminded of this over the summer when I had a chance to revisit the southern escarpment of the Palani Hills on a series of treks and camping trips. The treks involved revisiting areas that I had hiked to, both as a student at KIS and wondering soul in subsequent years. On the 2011 trips I teamed up with friends from school and the Vatakanal Conservation Trust to try to provide a brief assessment on the state of native grasslands. What we found was both illuminating and alarming. The cliff area between Kodaikanal and the Kerala border remains one of the most outstanding scenic landscapes in the Western Ghats. However, the invasion of native grasslands by self-seeding non-native tree species is happening at a faster-than-expected pace. As a result the area’s sublime ecology is in danger from disturbance that will be too great to reverse if some sort of restoring action is not taken. To date, much of the Palani Hills is under “reserve forest” which affords the range with basic protection but not the kind of glamour, finances and support from state agencies and non-governmental organizations that nearby wildlife sanctuaries, national parks and project tiger reserves get. Complicating factors like the booming tourist industry in Kodaikanal, the presence of large-scale non-native plantations and significant anthropocentric impacts in some areas have made notification difficult. Efforts to get the Palanis notified continue at the state and national level and have been a subject of online documentation. Some of these points were highlighted in my 2003 Frontline article “on the danger list.” Now nearly 10 years later I am interested in exploring issues that would contribute to better conservation of this area’s landscapes and biodiversity. Morning light on the cliffs by Ibex Peak, looking westwards and down to Bodinakyakunur. The monsoon is active over Bodimetu and the Cardamom Hills. Agamalai is in the far left (east) of the panorama. 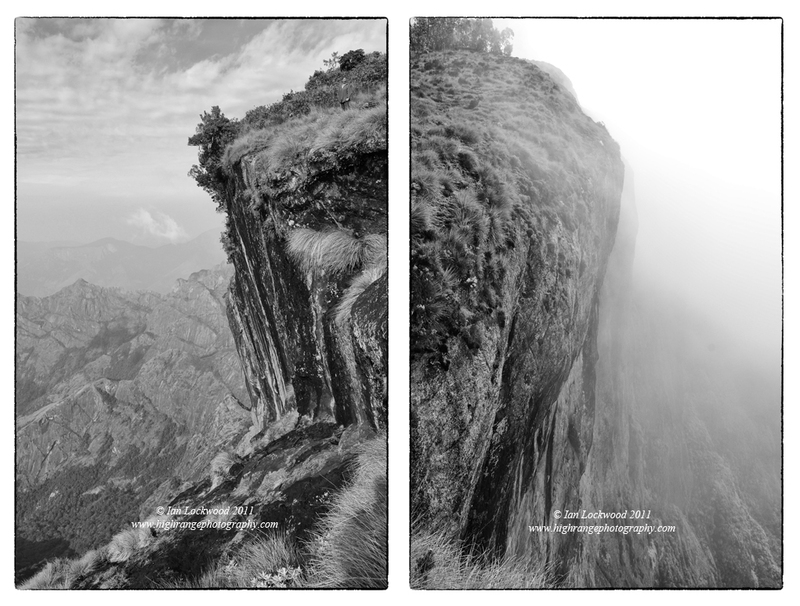 Two views of the ramparts of Ibex Peak, at 2516 meters, the 2nd highest mountain in the Palani Hills. True to the misnamed origin of the peak it appears to be an ideal refuge for Nilgiri tahr (Nilgiritragus hylocrius). We found plenty of pellet evidence and then observed from a distance two herds of 7-14 animals in the vicinity. Abstract formations at Ibex Cliff shelter a herd of Nilgiri tahr (not visible in this image). First light on Twin Peaks seen from the escarpment between Ibex Peak and Cliff. Maps highlighting the southern escarpment of the Palani Hills. 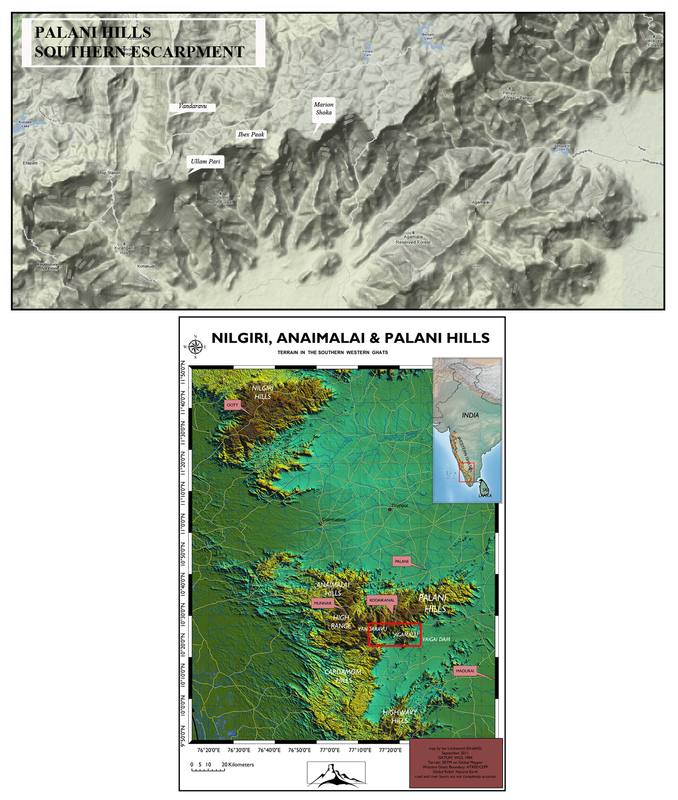 The maps above shows the cliff area and is modified from Google Maps while the one below shows the Nilgiri, Palani and Anaimalai ranges (created on Arcmap 10 and Globalmapper). Bruce watching the last light of the day on a grassy ridge overlooking Bodi.